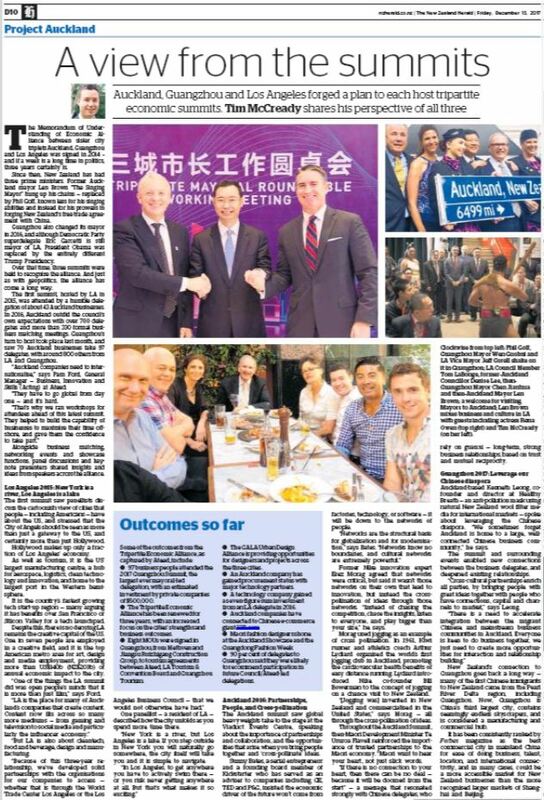 The Memorandum of Understanding of Economic Alliance between sister city triplets Auckland, Guangzhou and Los Angeles was signed in 2014 – and if a week is a long time in politics, three years certainly is. Since then, New Zealand has had three prime ministers. Former Auckland mayor Len Brown “The Singing Mayor” hung up his chains – replaced by Phil Goff, known less for his singing abilities and instead for his prowess in forging New Zealand’s free trade agreement with China. Guangzhou also changed its mayor in 2016, and although Democratic Party superdelegate Eric Garcetti is still mayor of LA, President Obama was replaced by the entirely different Trump Presidency. Over that time, three summits were held to recognise the alliance. And just as with geopolitics, the alliance has come a long way. 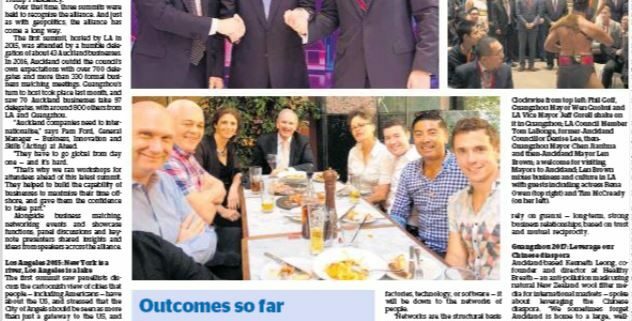 The first summit, hosted by LA in 2015, was attended by a humble delegation of about 43 Auckland businesses. In 2016, Auckland outdid the council’s own expectations with over 700 delegates and more than 330 formal business matching meetings. Guangzhou’s turn to host took place last month, and saw 70 Auckland businesses take 97 delegates, with around 800 others from LA and Guangzhou. “Auckland companies need to internationalise,” says Pam Ford, General Manager – Business, Innovation and Skills (Acting) at Ateed. Alongside business matching, networking events and showcase functions, panel discussions and keynote presenters shared insights and ideas from speakers across the alliance. The first summit saw panellists discuss the cartoonish view of cities that people – including Americans – have about the US, and stressed that the City of Angels should be seen as more than just a gateway to the US, and certainly more than just Hollywood. Hollywood makes up only a fraction of Los Angeles’ economy. As well as tourism, it is the US’ largest manufacturing centre, a hub for aerospace, logistics, clean technology and innovation, and home to the largest port in the Western hemisphere. It is the country’s fastest growing tech start-up region – many arguing it has benefits over San Francisco or Silicon Valley for a tech launchpad. Despite this, there is no denying LA remains the creative capital of the US. One in seven people are employed in a creative field, and it is the top American metro area for art, design and media employment, providing more than US$140b (NZ$203b) of annual economic impact to the city. “One of the things the LA summit did was open people’s minds that it is more than just film,” says Ford. One panellist – a resident of LA – described how the city unfolds as you spend more time there. “New York is a river, but Los Angeles is a lake. If you step outside in New York you will naturally go somewhere, the city itself will take you and it is simple to navigate. The Auckland summit saw global heavyweights take to the stage at the Viaduct Events Centre, speaking about the importance of partnerships and collaboration, and the opportunities that arise when you bring people together and ‘cross-pollinate’ ideas. Sunny Bates, a serial entrepreneur and a founding board member of Kickstarter who has served as an adviser to companies including GE, TED and P&G, insisted the economic driver of the future won’t come from factories, technology, or software – it will be down to the networks of people. “Networks are the structural basis for globalisation and for modernisation,” says Bates. Former Nike innovation expert Erez Morag agreed that networks were critical, but said it wasn’t those networks on their own that lead to innovation, but instead the cross-pollination of ideas through those networks. “Instead of chasing the competition, chase the insights, listen to everyone, and play bigger than your size,” he says. Morag used jogging as an example of cross pollination. In 1961, Kiwi runner and athletics coach Arthur Lydiard organised the world’s first jogging club in Auckland, promoting the cardiovascular health benefits of easy distance running. Lydiard introduced Nike co-founder Bill Bowerman to the concept of jogging on a chance visit to New Zealand. “[Jogging was] invented in New Zealand and commercialised in the United States,” says Morag – all through the cross-pollination of ideas. Throughout the Auckland Summit, then-Maori Development Minister Te Ururoa Flavell reinforced the importance of trusted partnerships to the Maori economy. “Maori want to hear your heart, not just slick words. “If there is no connection to your heart, then there can be no deal – because it will be doomed from the start” – a message that resonated strongly with Chinese delegates, who rely on guanxi – long-term, strong business relationships, based on trust and mutual reciprocity. Auckland-based Kenneth Leong, co-founder and director at Healthy Breath – an anti-pollution mask using natural New Zealand wool filter media for international markets – spoke about leveraging the Chinese diaspora. “We sometimes forget Auckland is home to a large, well-connected Chinese business community,” he says. The summit and surrounding events enabled new connections between the business delegates, and deepened existing relationships. “Cross-cultural partnerships enrich all parties, by bringing people with great ideas together with people who have connections, capital and channels to market,” says Leong. New Zealand’s connection to Guangzhou goes back a long way – many of the first Chinese immigrants to New Zealand came from the Pearl River Delta region, including Guangzhou. Now, Guangzhou is China’s third largest city, contains seemingly endless skyscrapers, and is considered a manufacturing and commercial hub. It has been consistently ranked by Forbes magazine as the best commercial city in mainland China for ease of doing business, talent, location, and international connectivity, and in many cases, could be a more accessible market for New Zealand businesses than the more recognised larger markets of Shanghai and Beijing.